What'S It Really Like Studying In The Uk? Students of the 21st century have a plethora of choices available to them while choosing the right fit university. In an increasingly competitive international environment, UK Universities provide an inside edge which helps to clearly define career pathways. The first-rate educational infrastructure, and highly qualified faculty, combined with a rich historical heritage and diverse cultural backdrop makes the UK an appealing destination for the well-researched, focused, modern day student. Traditionally, Oxford and Cambridge along with the eminent Russell Group universities such as Imperial, Kings, and LSE, to name a few, have been much sought after by students globally. They are renowned, not just for their high-quality education, but also for enhancing key skills such as those of critical thinking and creativity. They are also steadfast in maintaining the best research, teaching and learning experiences and unique associations with the professional and the public sector. The system of "tutorials" at Oxford and "supervisions" at Cambridge allows for very small group based teaching sessions on a regular schedule. Students are able to benefit greatly from this focused and highly academic interaction. A distinct benefit of the tutorial system is that it allows students to receive direct feedback on their weekly essays and work in focused discussion settings. As a consequence, the time spent interacting with their professors is substantive &qualitative. The newer universities also offer courses which are in keeping with the growing demand for niche skills, such as those required for sports science and the communications industry. There is now an increased flexibility of choice wherein it's not uncommon to have students studying music with geography, fashion and design with business or still being able to choose subjects like biochemistry with the opportunity of being able to learn from world-renowned professional experts and academics. Many universities in the UK now offer the liberal arts option with students studying the core curriculum in the first year, and then choosing their area of specialism subsequently which allows them flexibility and leads into well informed undergraduate choices. Universities in the UK consistently find a place on the QS world rankings amongst the leading universities globally, with a reputation for research and learning that is second to none. A significant advantage for students studying in the UK is the collegiate system whereby smaller colleges offer specialized courses but are affiliated to and accredited by major universities. The shorter duration of undergraduate and postgraduate study in the UK helps to keep the cost of tuition fees and living expenses lower. It enables a more intense, in-depth programme of study which is why students pursuing specialized courses such as medicine and law are immersed in their particular area of specialization from the very first day on campus. While most undergraduate courses take three years to complete, postgraduate courses generally last a year. The access and connectivity that the UK enjoys not just to Europe, but to the rest of the world, opens up new horizons for students through study abroad and sandwich courses, where students are able to work in industry or study abroad. These four years courses are offered with an in-built work experience which normally takes place in the third year. A student's placement typically depends on the area of study; for example, a languages student might study at a university outside Britain, while business students will work with companies either in the UK or away, and those in the sciences might well benefit from experience in a laboratory setting. It is no surprise then, that the very best intellectual talent is associated with the United Kingdom. Many of the world's greatest thinkers and leaders including Mahatma Gandhi and Desmond Tutu have studied in the UK. It is estimated that UK universities and research institutions have produced over 100 Nobel Prize winners. UK universities are known to deliver affordable, intellectually stimulating, and an undisputed excellent quality of education. Historically as well, the UK has been known to welcome international students and provide them with a foundation and platform that will equip them with the skills needed to become leaders in their chosen fields. This is achieved in a lively, diverse and welcoming community which makes for lifelong associations and friendships, making it a leading choice for students worldwide. An international educator for over twenty-five years, Ms. Vanita Uppal OBE is the Director (Head of School) of The British School New Delhi. 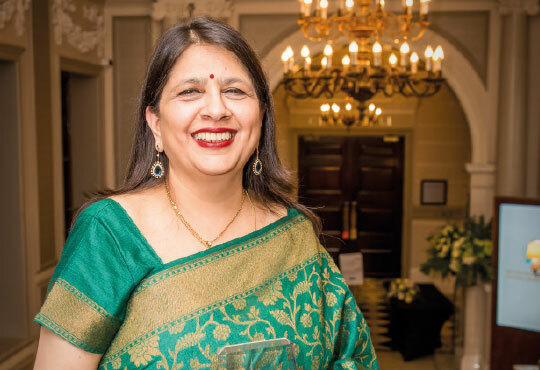 In 2014, the British government conferred the Order of the British Empire (OBE) on her and Ms. Uppal became the only Indian serving Principal to be bestowed with this honor. She holds a Master's and Bachelor's degree in History from St. Stephens College, Delhi University and is a University topper both in her Master's degree and in her teaching degree from Central Institute of Education, University of Delhi.